Just as Kubernetes reinvented how we all think about a compute platform, there is a need to transform how we use storage for modern applications. As companies rely increasingly on digital services to reach their clients, traditional enterprises are replatforming their IT services on Kubernetes. The benefits of container portability and Kubernetes automation mean faster and more reliable delivery of applications throughout the dev/test and production lifecycle. 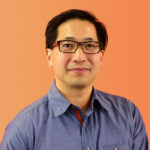 Meanwhile, companies must think about multi-cloud not only as a sourcing strategy but also as a way to deliver applications with the highest fidelity and closest proximity to their customers. The traditional storage industry has not done enough to address the confluence of these forces: container portability, Kubernetes automation, and multi-cloud delivery. 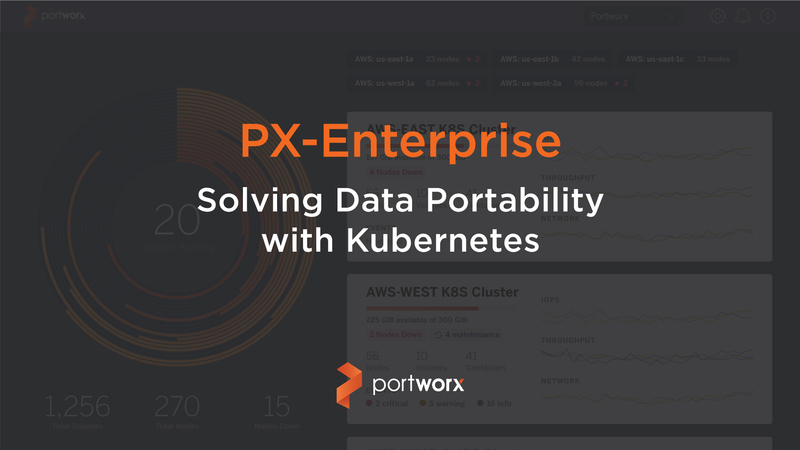 The first Portworx PX-Enterprise product began with enabling seamless high-availability for data-rich workloads in Kubernetes whether they run on-premises and in a public cloud. With our version 1 product, DevOps teams get a scheduler-integrated experience, full data lifecycle management, and critical production functionality like BYOK encryption and cloud backups. As adoption grew in enterprises and Portworx became an integral platform for IT departments, it became clear that version 1 was an incredible release and that we, as an industry, are just at the start. In working with our amazing customers who have deployed in every major public cloud and on-premise platform, we have taken to heart their vocal requests for full data portability, further automation of operations, and a true ability to deliver data-rich applications into multiple clouds. Based on their co-development of our roadmap and the work of an incredible group of engineers, we are proud to announce PX-Enterprise 2.0. Built on the stability and scale of our first version, PX-Enterprise 2.0 adds multi-cloud migration and centralized data management that will enable enterprises to run and migrate workloads easily and with fine-grained control. There is a lot of new functionality to cover but two features that customers have been passionate about in our early access program have been PX-Motion™ and PX-Central™. PX-Motion brings full portability to data-rich workloads in a controlled and Kubernetes-integrated manner. Now IT can have the same benefits that Kubernetes brings to stateless workloads with databases, analytics stacks, machine learning, and other data services that power every digital business. 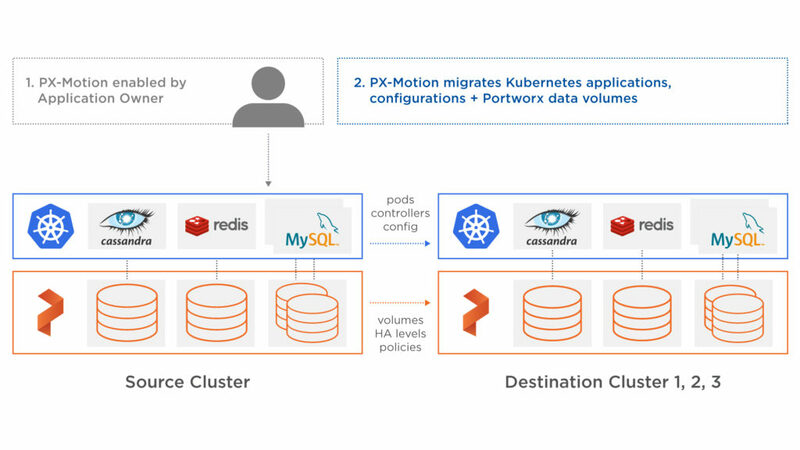 In a single command, PX-Motion moves Kubernetes applications, Kubernetes configuration, and Portworx data volumes across clusters and clouds. Augment capacity. Free capacity on critical clusters by evacuating lower priority applications to secondary clusters. Blue-green deployments. Test new versions of Kubernetes and/or Portworx with both applications and their data. This is the same blue-green approach used by cloud-native application teams– now available for your infrastructure. Clean install. Every installation of infrastructure from Kubernetes to Portworx becomes a fresh install rather than an in-place upgrade. This gives an immutable infrastructure approach whether on-prem or in the public cloud. Dev/test. Promote workloads from dev to staging clusters in an automated manner. Thereby, eliminate the manual steps for data preparation that hurts test fidelity. Lift/Shift. 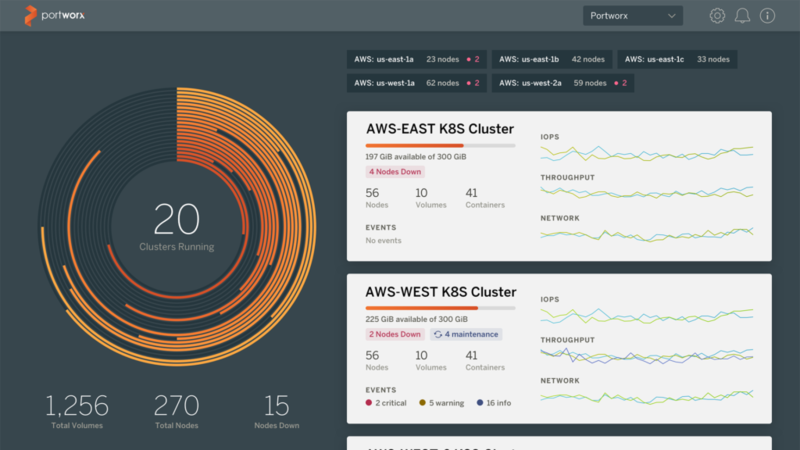 Move applications and data from an on-prem cluster to a cloud-hosted Kubernetes cluster on AWS, Google, Azure, IBM or elsewhere. The reverse is also supported to repatriate, move applications on-prem. Maintenance. Migrate an entire cluster’s applications and data in minutes in order to perform hardware-level servicing. As PX-Motion enables migration across clusters and clouds, PX-Central provides the necessary visibility to control and manage that data portability. 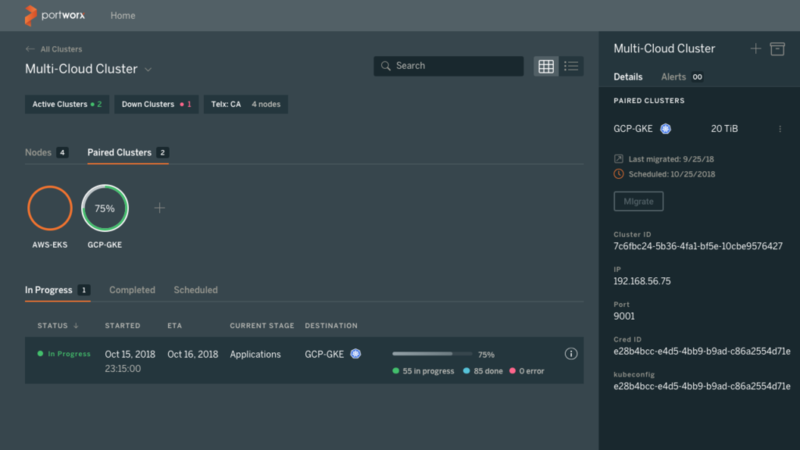 Administrators and application teams can now schedule, control, and visualize the state of an ongoing migration at a per-application level. Not just that, PX-Central radically simplifies the general management of any data-rich workload. With PX-Central, customers get a single pane of glass for management, monitoring and metadata services across multiple Portworx clusters and clouds. A multi-cluster management GUI. Provides a single-pane of glass for all your container data needs including tracking capacity, setting configuration, and monitoring metrics. Centralized configuration and scheduling. Simple setup and enforcement for key data protection mechanisms including snapshots and backup to cloud using PX-Enterprise CloudSnap™. Built-in metadata services. Removes the need for customers handling etcd services when using PX-Enterprise and makes clusters more managed, self-contained. Proactive monitoring. Arrives ready configured for tracking and analyzing metrics, alerts, and anomalies allowing teams to operate more efficiently at scale. Listening to our customers and developing our roadmap with them, we have aligned our 2.0 release today around their requirements for data portability, ops automation, and multi-cloud delivery of their data-rich services. We are incredibly fortunate to have such wonderful customers who are themselves innovating on behalf of their clients. It is indeed an exciting time for infrastructure. With PX-Enterprise 2.0, we see enabling seamless multi-cloud data portability as just the next step. From here, we will be adding on what our compliance-oriented and largest global enterprise customers have been asking for. We look forward to sharing more on this with everyone early next year. In the meantime, join us on December 6th for a live webinar where we will cover key features of PX-Enterprise 2.0. We will cover performance improvements, automated changes, and of course PX-Motion and PX-Central. And if you’re at KubeCon, please find us at booth G9!